The Linx Vision combines the power of Windows 10 with blockbuster gaming and puts them at your fingertips. From casual games to intense multi-player scenarios, the immersive 8" display and 64-bit Quad-Core Intel Atom chipset deliver high-intensity gaming experiences by using the power of Windows 10 in-house streaming for PC, Steam and Xbox One games. The linx vision features intel's latest 64-bit atom cherry trail x5-z8300 processor for raw tablet performance and streaming capabilities. Built specifically for windows 10, the linx vision is fully fledged pc with great free and paid games, apps, movies, tv shows and the latest music all available at the new windows stores. Take control and dominate the competition with full xbox and pc gaming suport intergrated into the linx vision controller system. Immerse yourself in a new yet familiar gaming experience with dual analogue controllers. 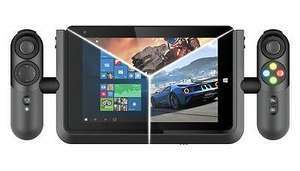 1.84GHz Intel Atom quad core processor. Up to 7 hours battery life (depending on usage). Brilliant advice where can I buy a Switch for under £100??? To stop me buying another hand held I’ll never use, can it run N64 roms flawlessly? Cracking price. Wonder what kind of state they are in? I bought one of these on release, was really looking forward to it but ended up hating it. The controllers feel as awkward as they look. The tablet itself was competent enough, but it was a small sharp-edged brick compared to the original Linx 8 I traded in in preparation of getting this. Streaming was ok but I was totally put off by the controller dock. The tablet bricked within two weeks, and it was a blessing as I then had grounds to return it for a full refund. To stop me buying another hand held I’ll never use, can it run N64 roms f …To stop me buying another hand held I’ll never use, can it run N64 roms flawlessly? Anyone got one of there, seems to run n64 and below well? Struggles with PS1 and saturn etc. I've had one of these for a while now. The controller does take quite a bit of getting used to. They are pretty competent as a standalone tablet too. I bought it so I could still play XBOX without taking over the big telly. Got this to test out xbox streaming I currently use my acer switch and it lags a bit not a issue playing slower games and but for fps the lag doesn't do it. I will also see how emulators are on it if it's rubbish it going back. Got this to test out xbox streaming I currently use my acer switch and it …Got this to test out xbox streaming I currently use my acer switch and it lags a bit not a issue playing slower games and but for fps the lag doesn't do it. I will also see how emulators are on it if it's rubbish it going back. Do you happen to use a Bluetooth controller? Bluetooth and older wifi networks both share the 2.4Ghz wireless frequency, which causes interference which affects streaming. If your tablet and wireless router support it, connect to a 5Ghz dual-band wifi network, or to test, connect to your router using ethernet cable (using an adapter if necessary), to rule out if your issues are due to hardware or network. So this device will be no good for my needs? My laptop is connected wireless ac and my Xbox connected via cabled network I don't have trouble streaming other content like 4k from my network hard drive ect. Do you happen to use a Bluetooth controller? Bluetooth and older wifi …Do you happen to use a Bluetooth controller? Bluetooth and older wifi networks both share the 2.4Ghz wireless frequency, which causes interference which affects streaming. If your tablet and wireless router support it, connect to a 5Ghz dual-band wifi network, or to test, connect to your router using ethernet cable (using an adapter if necessary), to rule out if your issues are due to hardware or network. Thanks I do connect to 5ghz band and I use the official xbox controller that connected tried both Bluetooth and using it connected to my Xbox. What lags is not the input but the stream to my laptop. Just a heads up for ps4 owners. Remote play works well using the inbuilt controller. I can write a how to on the linx tablet forum if anyone wants? ?